Raised in Princeton, NJ, I got my start in music while serving in the U.S. Navy. Then in 1972 while attending Rider College in Lawrenceville, NJ. 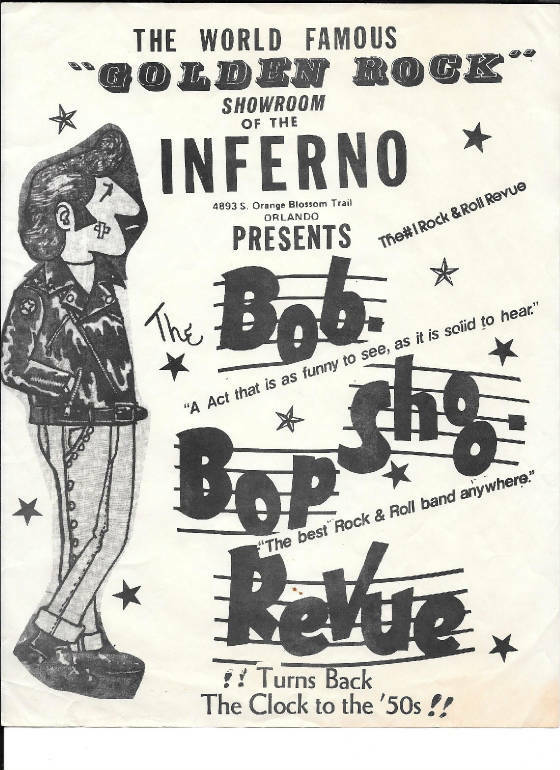 I joined the Bob-Shoo-Bops, a theatrical oldies revue who were similar to Sha Na Na, singing, dancing and acting out the great songs from the 1950's & 60's. 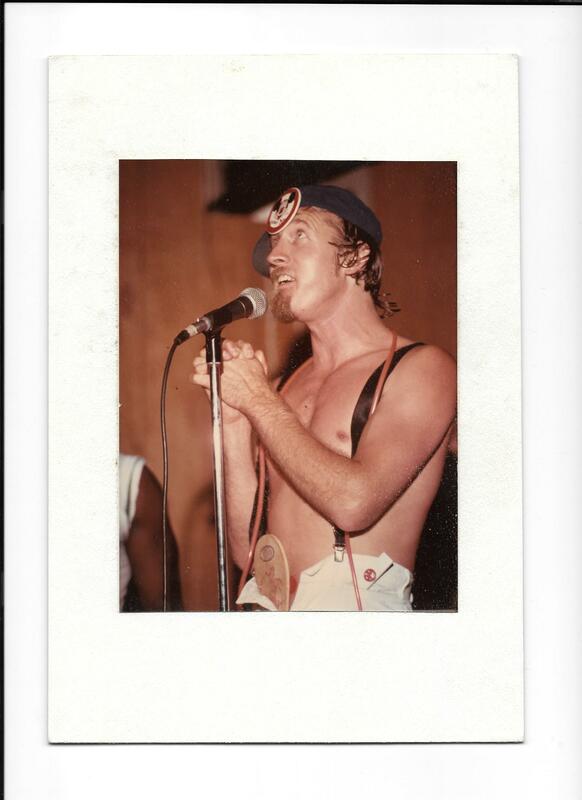 By graduation time in 1973, I found myself hooked on performing and toured the USA and Canada for over 4 years with the Bob Shoo Bops. For more information about the Bob Shoo Bops, search on Goggle and Facebook. 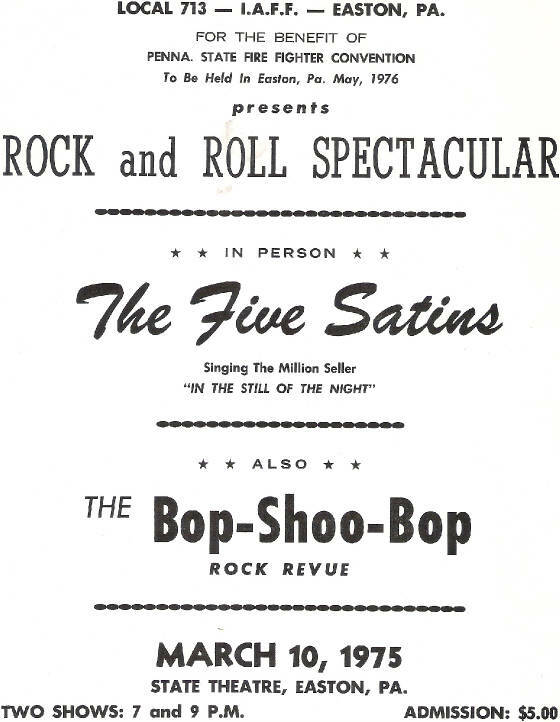 The Bob Shoo Bops entertained over 4 million people and were on the billing with over 100 oldies acts, such as Johnny Maestro and the Crests and Brooklyn Bridge, Little Richard, Chubby Checker, Tommy James and the Shondells, and actually sang back up for Dion on Runaround Sue at the Philadelphia Civic Center. 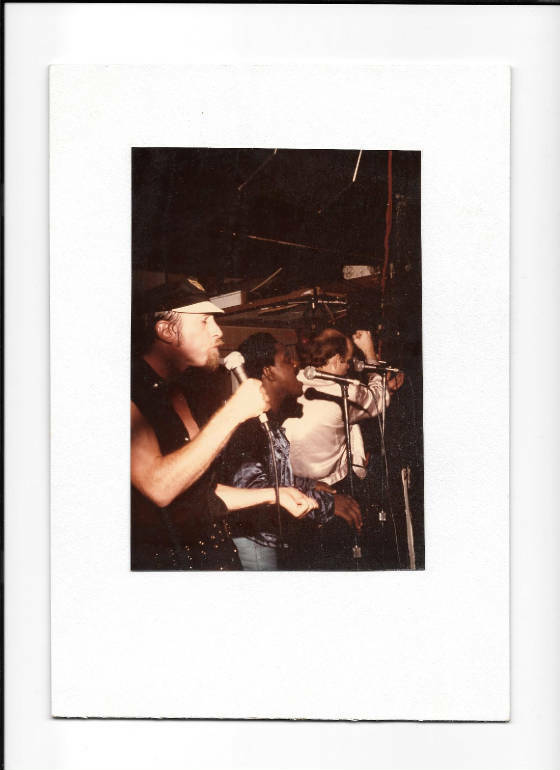 I eventually formed a cover band, First Class Act, who performed for over 20 years playing at weddings, parties, reunions and oldies concerts, sometimes with over 10,000 in attendance. The Bob Shoo Bops pictures below were from 1974 and 1972 respectively. 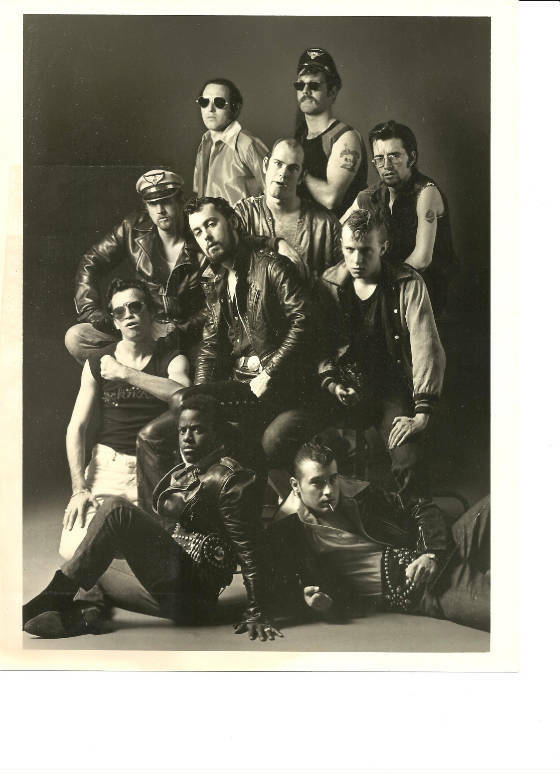 The members in the 1974 photo starting from the lower left corner and going clockwise are: Johnny Jackson-singer, Carlo Altomare-keyboard and singer, Fred Campbell-singer, Stephen Munter-Saxophone, Mark Mulrine-singer, Bob McCaskey-bass player, Steve Morley-singer, Steve Trovato-Guitar, left center in leather jacket is Geoff Brothers-drummer, middle center is Bob Bradbury, singer and general manager. 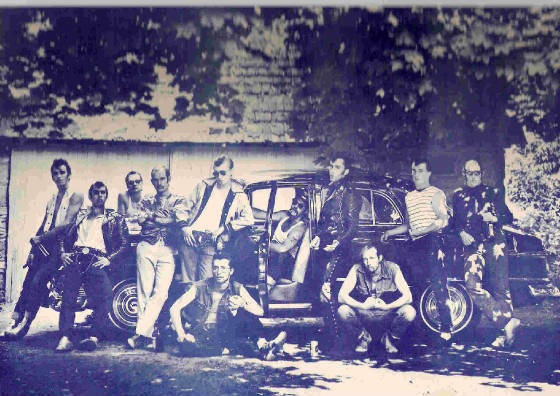 The members in the 1972 photo starting from left to right standing are: Carlo Altomare-keyboard and singer, Gary Delena-singer, Steve Scheier-singer, Bob Bradbury-singer and manager, Steve Morley-singer, Mark Mulrine-singer (sitting in drivers seat), Geoff Brothers-drummer, Steve Trovato-guitar, Stephen Munter-Saxophone and keyboard. 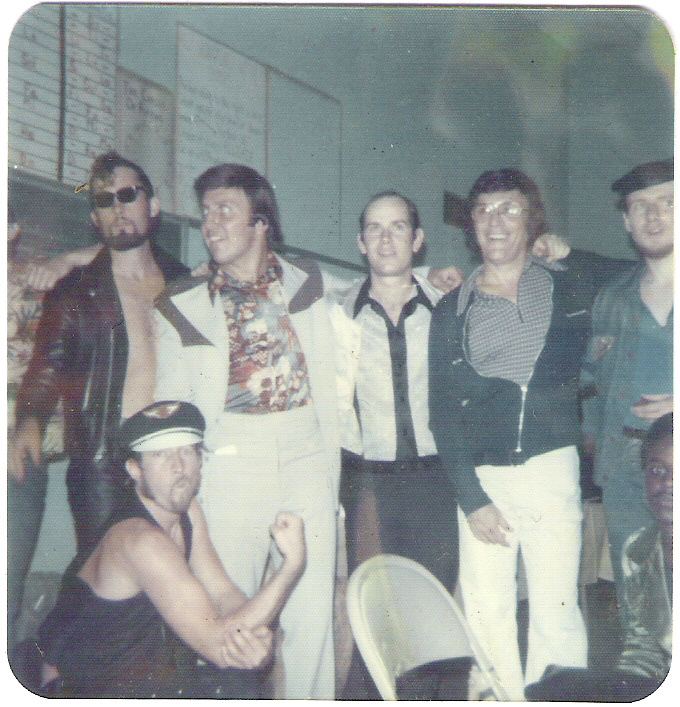 Left to right on the bottom row are Bob McCaskey-bass player and nicknamed "toolie" who could fix anything: and Fred Campbell-singer. For more photos regarding the Bob Shoo Bops, continue scrolling down this page. 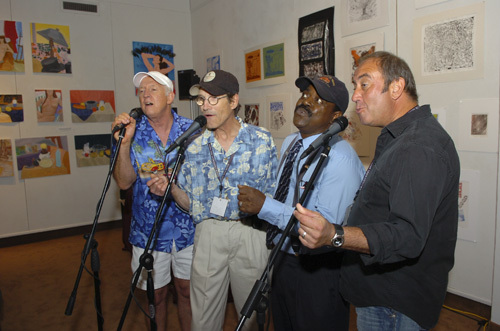 (L to R) Fred Campbell on lead vocal, Steve Scheier on first tenor, Johnny Jackson on second tenor and Gary Delena on baritone sing Daddy's Home at the Rider University Reunion on June 23, 2006. You are just a click away from hearing them sing it!!! Additional photos of the Bob Shoo Bops. 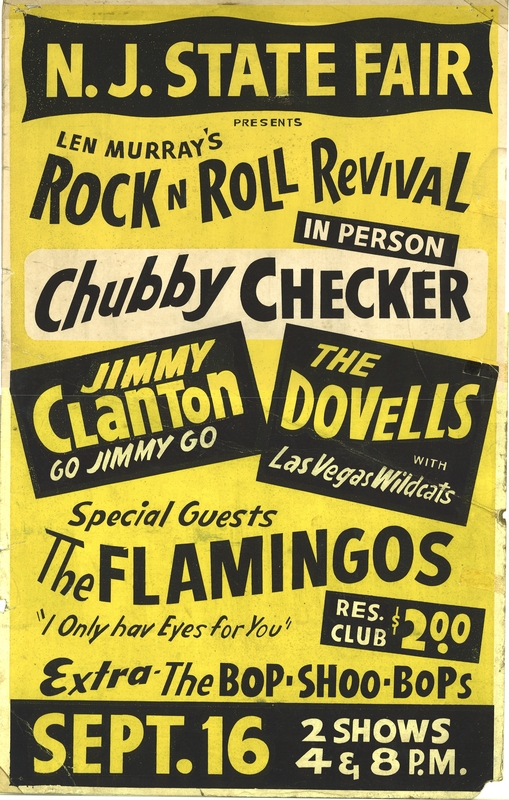 First poster is a concert at the New Jersey State Fair with Chubby Checker, Jimmy Clanton, The Dovells and The Flamingos. 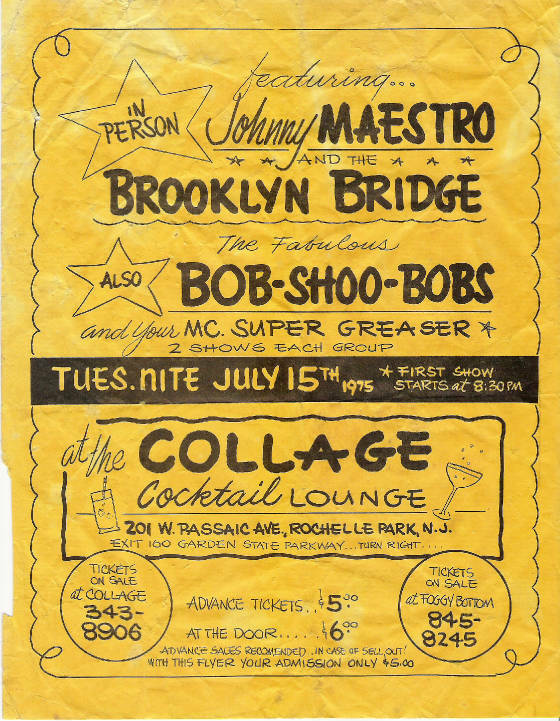 The second poster is one of 2 times we were on the billing in 1975 with the Brooklyn Bridge featuring Johnny Maestro in Rochelle Park NJ. 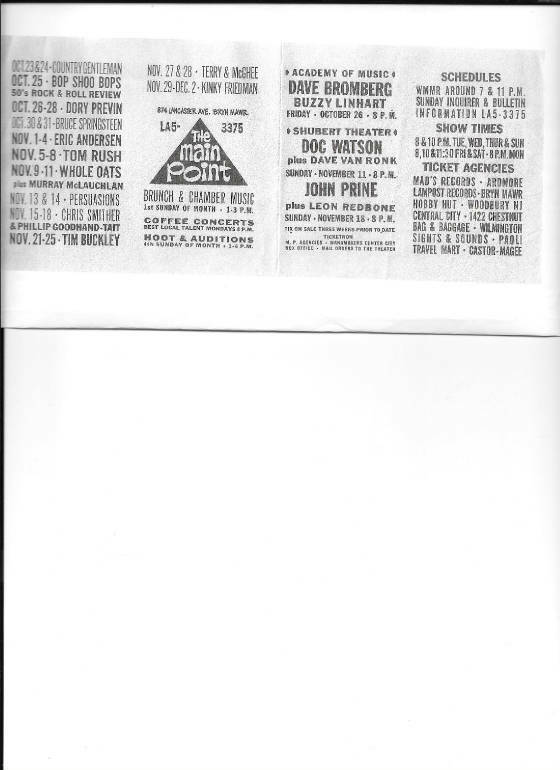 The third poster is when we were on the billing with Freddie Parris and Five Satins in Easton, PA. 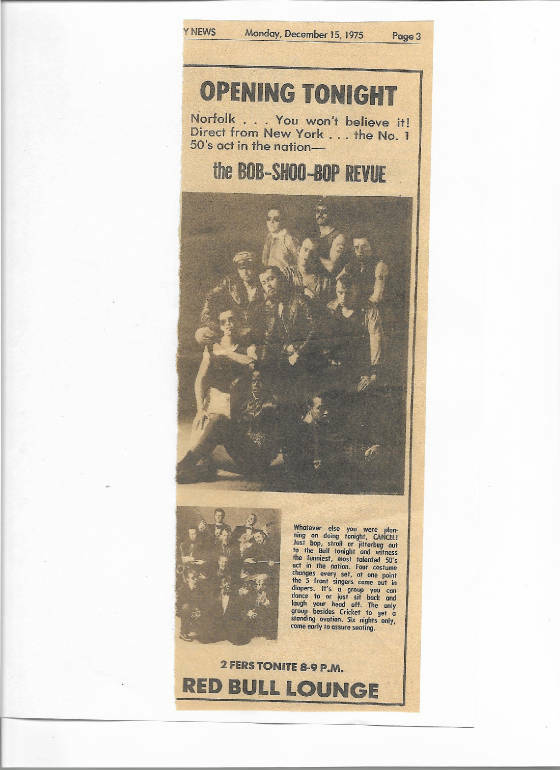 The fourth picture is is when Murray the K ( second from right wearing glasses ) was the Emcee at Belleville High School introducing the Bob Shoo Bops. 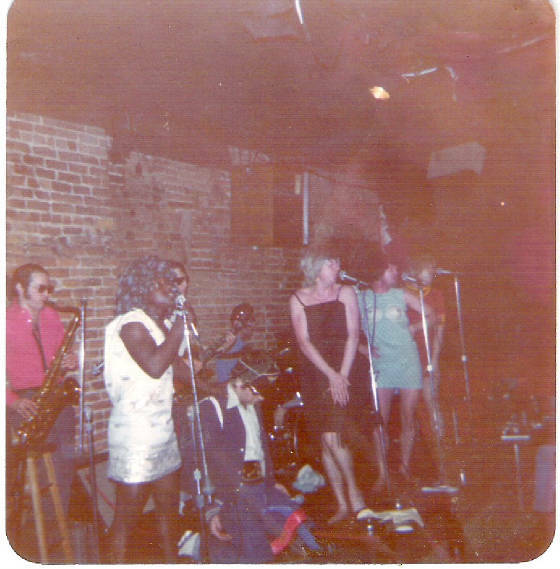 The fifth picture is when the Bob Shoo Bops performed at the famous BITTER END in New York City and dressed as women and sang The Leader of the Pack with Johnny Jackson on Lead vocal and Mark Mulrhine on the little toy tricycle which was always a crowd pleaser. The sixth photo is when we performed at the famous BITTER END in New York City. The photo on the left is when we sang the Beach Boys medley and the photo on the right was our Greaser set. In the center of the photo are of famous acts like the Everly Brothers and Neil Young who also sang at the Bitter End. The seventh photo is a promotion poster featuring quotes from write ups about several concerts. I invited writer John S. Wilson of the New York Times who gave the Bob Shoo Bops a fantastic front page review on the New Jersey section of the New York Times. 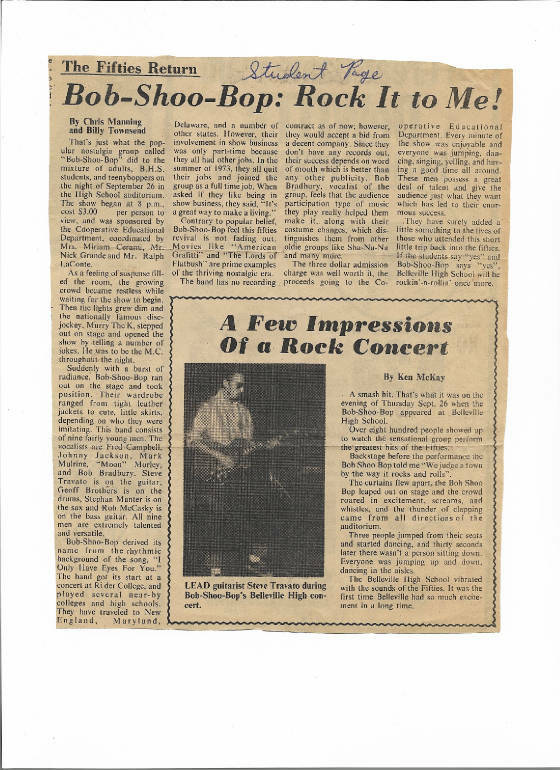 Other write ups were from Middletown High School, Rider College and a poster when we sang at Belleville High School in Monclair New Jersey with MC Murray the K.
The seventh photo is when I dressed in a Little Rascals outfit when we sang a medley of songs by the Young Rascals. I sang "I've Been Lonely Too Long". Other Rascals songs we sang were "Good Lovin" and "People Got To Be Free"
The eighth photo is when I sang Blue Moon when we sang our Greaser Set. From L to R, Fred Campbell, Johnny Jackson and Bob Bradbury. Other singers not in photo. The nineth poster is when we performed at the world famous INFERNO in Orlando, FL. The nightclub was so large that they had several classic cars that you could actually watch our shows inside a 1957 Chevy and be served your food and drinks. 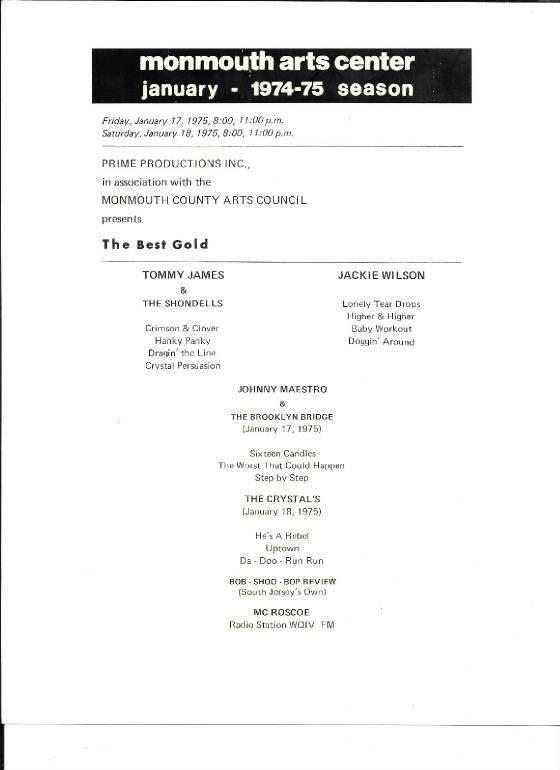 The tenth poster is when we performed at the Carlton Theater sponsored by the Monmouth Arts Center (later to be renamed the Count BasieTheater in 1984) on January 17 & 18, 1975 with Tommy James and the Shondells, Jackie Wilson and Johnny Maestro and the Brooklyn Bridge and the Crystals. The eleventh photo is when the Bob Shoo Bops performed at The Main Point in Bryn Mawr, PA. on October 25th and Bruce Springsteen performed on October 30 & 31. The twelveth photo is from 1972 when (L to R) Steve Scheier on tenor harmony, Fred Campbell on lead and Gerry Treacy on baritone sang Daddy's Home a ccapella at Hogan's Restaurant in Lawrenceville New Jersey. 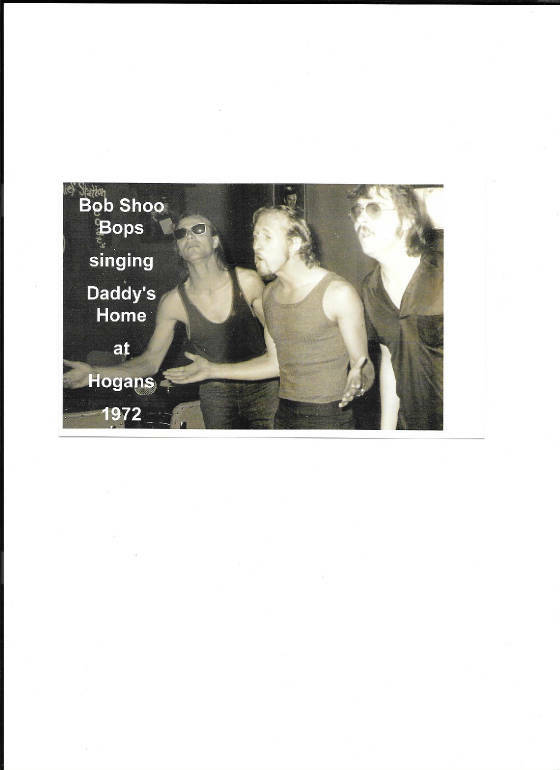 The Bob Shoo Bops sang at Hogan's every Sunday night in the summer of 1972 and added more musicians in 1973. Gerry Traecy was responsible for inviting me to audition as a singer in the Bob Shoo Bops after we met in 1971 at a guitar-singer workshop at Rider College. 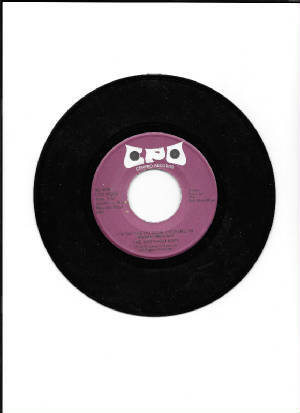 Bob Shoo Bops recorded Play Those Oldies Mr. DJ with Gary DeLena on lead vocal in 1975 on Cenpro Records. Bob Shoo Bops recorded I'm On The Outside Looking In with Johnny Jackson on lead vocal in 1975 on Cenpro Records.